Who needs tuna?! 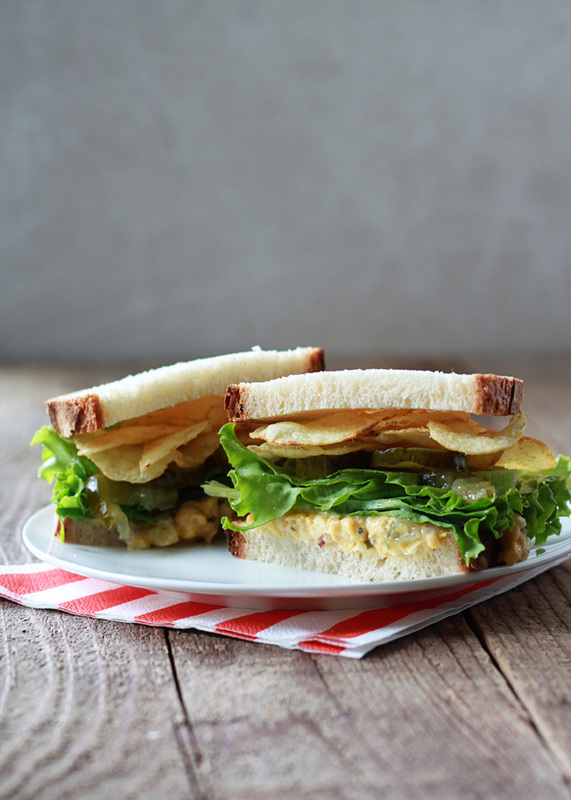 Chickpea salad is a tasty vegetarian substitute, especially when piled with extra pickles and, yep, crunchy potato chips too. Stack ’em high! Many vegetarians confess to missing bacon the most, but when it comes to lunch, I’ve gotta say: I miss tuna sandwiches. They were so comforting, satisfying, and easy. 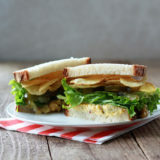 Which is why these Chickpea Salad Sandwiches with Potato Chips & Pickles fill that lunchtime void – something I was missing for so long. 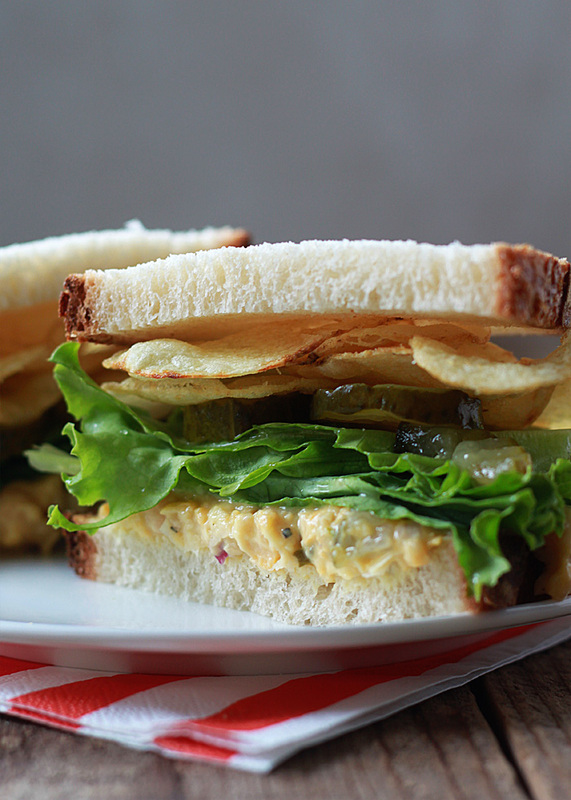 Do you remember, as a kid, sneaking a few potato chips onto your sandwich? 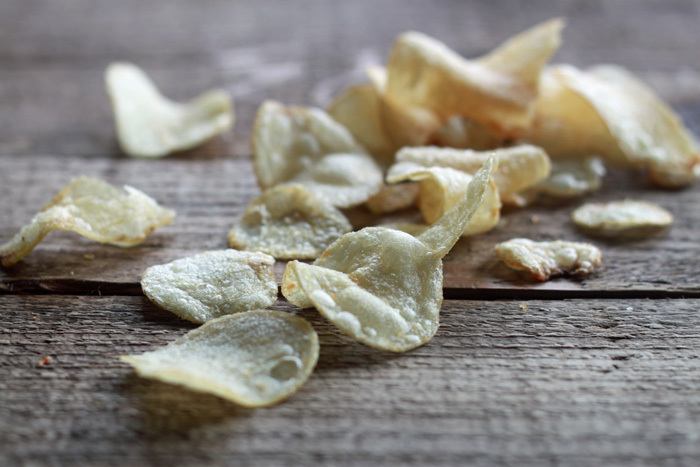 That salty crunch, the slightly rebellious maneuver. Well, today, not only am I declaring chickpea salad the perfect swap for tuna, I’m also proposing we remove the shameful cloak from the practice of potato-chip-sandwich-stuffing. Loud and proud, my friends. Loud and proud. Put those potato chips in with purpose. THE RECIPE CALLED FOR IT! You won’t regret it. 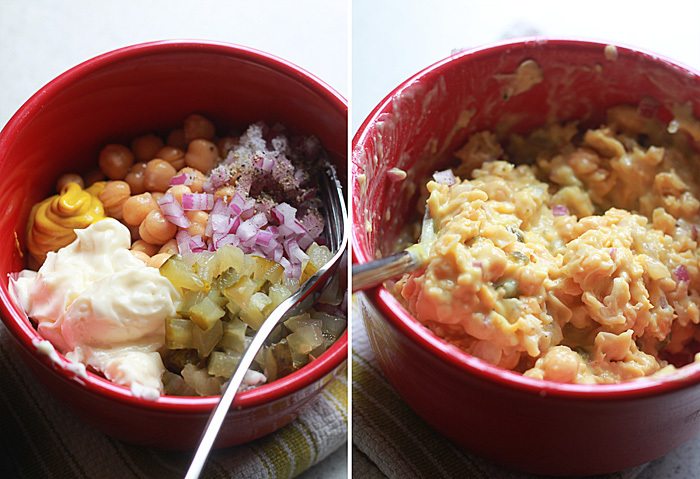 So, chickpea salad. Basically, you take a can of chickpeas (also known as garbanzo beans, if you prefer), and smash them up with your typical tuna salad ingredients. I like mayo, mustard, onion, pickles, and a touch of salt and pepper. Maybe some celery or celery salt. That gives you a tasty, creamy-but-with-bite sandwich filling that, I think, is the perfect sub for tuna salad. Don’t forget the extra pickles, a few leaves of crunchy lettuce, and, of course the potato chips. Stuff ’em proud! Add the chickpeas, 1/4 cup chopped pickles, onion, mayonnaise, mustard, celery salt if using, kosher salt, and black pepper to a small bowl. Using a fork or potato masher, smash the chickpeas while mixing and mashing the ingredients together. You’re not looking for hummus-consistency; just a nice, spreadable, chunky salad will do. Divide filling between two slices of bread (you may have enough to make more sandwiches, depending on your preference and the size of your bread). Spread to within about 1/2 inch of the edge of the bread. Add lettuce if using, pickle slices, and potato chips. Top with remaining bread. Smush down a bit, cut in half, and serve. Never mind passing this over the fence as I am making it now! I totally forgot about using garbanzos in this way… Love it! Growing up a tuna chip sandwich and chocolate milk was a favorite. Today, I don’t do milk or tuna, but chips…….well, YES! I love that you added chips to your sandwich! I am totally going to do that the next time that I make a chickpea salad. I’ve been meaning to make a veggie replacement for egg salad or chicken salad, and this chickpea salad looks perrrrfecto. 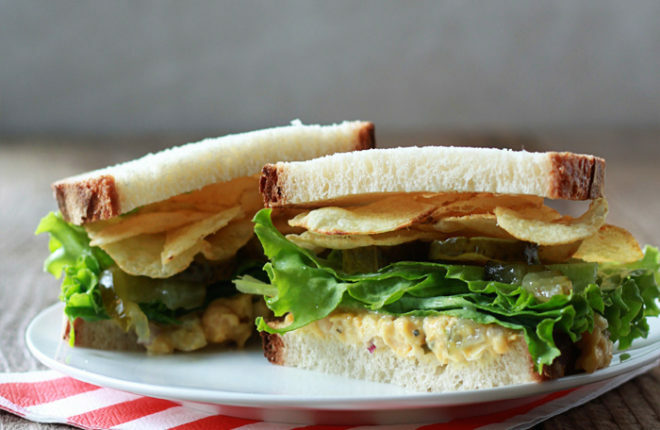 I’m OBSESSED with tater chips on my sandwiches (and on burgers…and in hot dogs), so this sando is seriously calling to me. YUM! Hope your weekend is going well, my dear! Another perfect recipe, Kar! Thank you! what a great idea! i’ve been eating a lot more chick peas lately. this will definitely be in my lunch rotation! First time commenter, long-time reader. I just had this for lunch and I have to say it’s the perfect work lunch. High protein to get me through the afternoon slump; one-handed so I can turn pages in the book I’m reading with the other; and doesn’t smell. That last one is pretty important. The last time some one brought tuna salad to work, the place smelled of rotten fish for a week. Kudos on a BRILLIANT IDEA. It’s a great way to pull some meat out of my week, too, since I am trying to reduce my meat consumption for health and environmental reasons. THANKS! Ha, my husband just took leftover fish to work for lunch and I was teasing him about being “that” guy at work. 😉 Thank you so much for both reading and commenting!